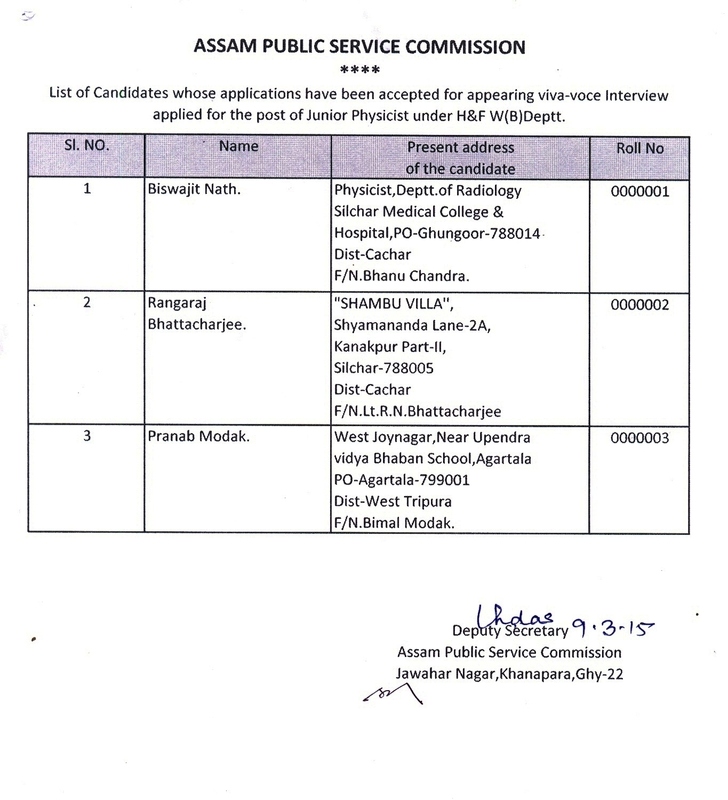 Second Additional Select List for the post of Lecturer in Assamese (DIET) under Elementary Education Department vide Advt. No. 13/2017 Dated: 22-11-2017. 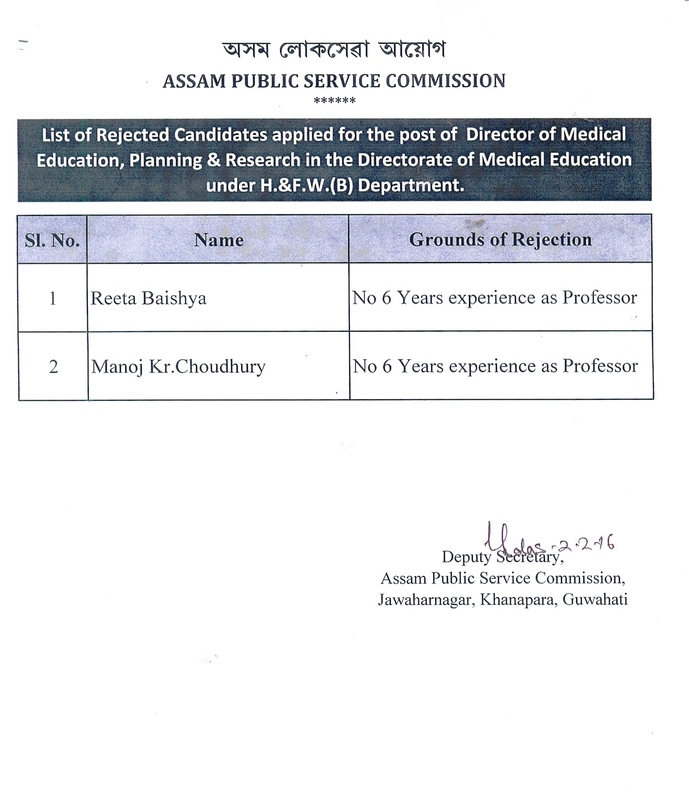 Additional Select List for the post of Lecturer in Assamese (DIET) under Elementary Education Department vide Advt. No. 13/2017 Dated: 22-11-2017. 1)Accepted 2)Rejected Guidelines for searching names. 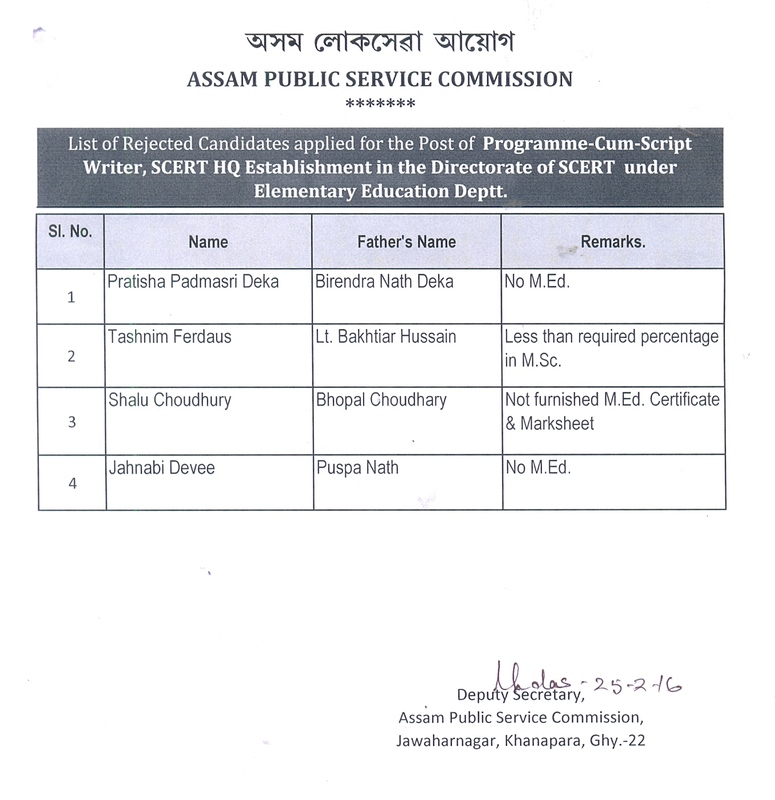 Additional select list for the post of Lecturer of District Resource Unit (DRU) DIETs under the Directorate of SCERT, Assam vide Advt. No.15/2015. Status of Application for appearing in the Departmental (Promotion) Examination 2018 for recruitment into Assam Finance Service to the post of FAO/TO (Class-I, Grade-III) under Finance (Estt.-B) Department. Status of Application for the post of Scientific Officer (Ballistics Division) in the Directorate of Forensic Science, Assam, Guwahati under Home & Political Deptt. Status of Application for the post of Assistant Professor in Nyaya in K.K. Handique Govt. Sanskrit College under Higher Education Deptt. 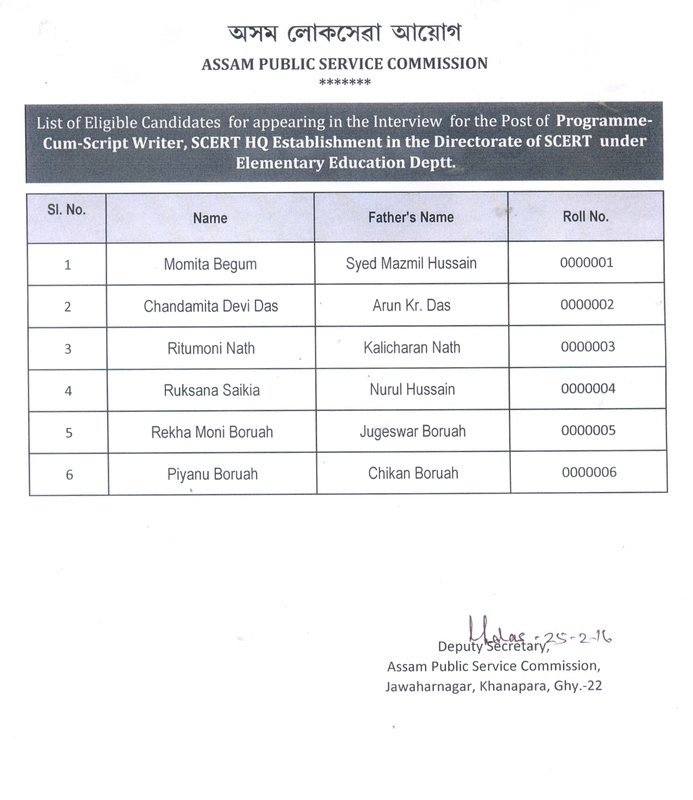 Additional select list for various posts of Lecturer in DIET in the Directorate of SCERT under Elementary Education Deptt. Notification: Additional Select List for Interview/Viva-Voce for the post of Medical Inspector of Factories under Labour Welfare Deptt. Status of Application for the post of Medical Inspector of Factories under Labour Welfare Deptt. Status of Application for various posts of Lecturer in DIET in the Directorate of SCERT under Elementary Education Deptt. Revised Status of Application for the post of Director of Economics & Statistics under Transformation & Development Deptt. Notification: Additional Select List for Screening test for the post of Inspector of Schools/DEEO/Deputy Director under Education Secondary Deptt. Status of Application for the post of Director of Economics & Statistics under Transformation & Development Deptt. 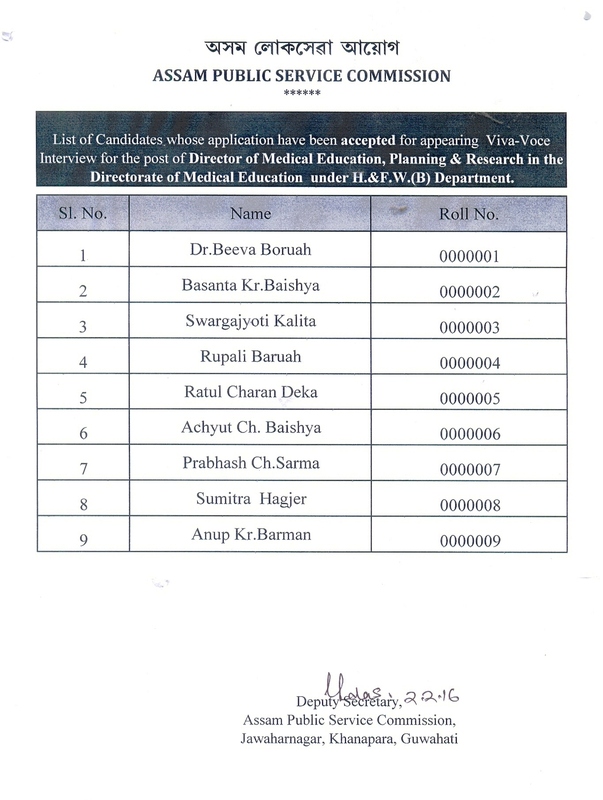 Additional list of selected candidates for appearing in the Interview/Viva-Voce for the post of Distric Museum Officer under Cultural Affairs Deptt. Status of Application for the post of Distric Museum Officer under Cultural Affairs Deptt. 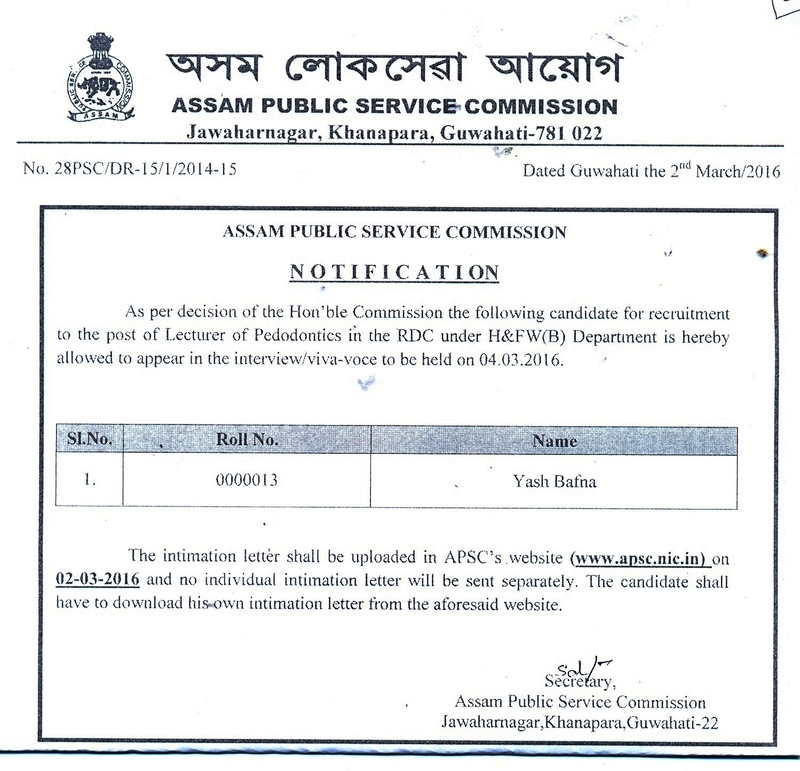 Notification: Reject list of candidates for the post of B.D.O., 2015 under Panchayat and Rural Development Dept. Status of Application for the post of Law Assistant to Legal Remembrancer and Under Secretary to the Govt. of Assam, Judicial Department. 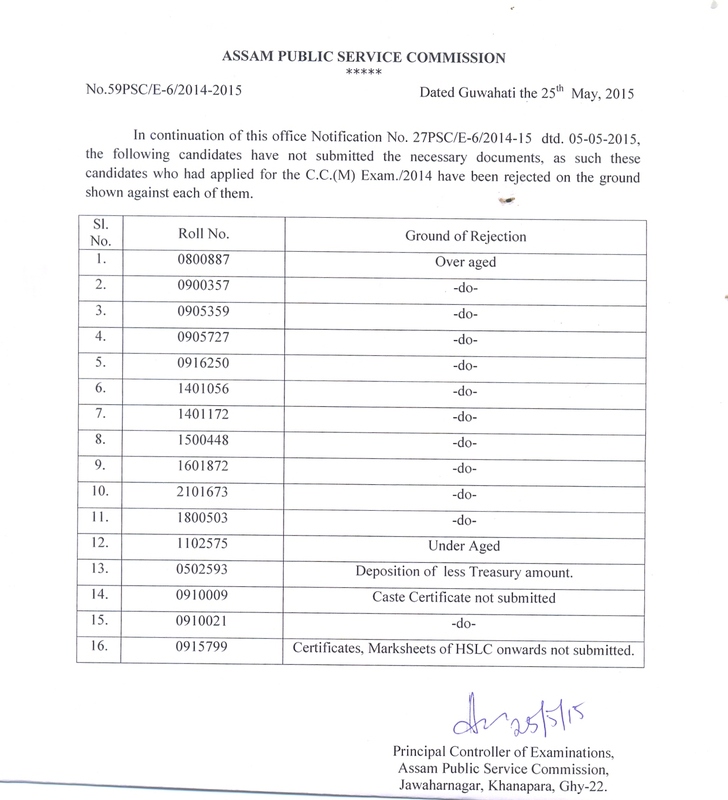 Status of Application for the post of Asstt. Director, T&CP under Urban Development Deptt. Status of Application for appearing in Viva-voce/Interview for the post of Inspector of Factories under Labour & Employment Deptt. Status of Application for appearing in Viva-voce/Interview for the post of Agricultural Development Officer under Agriculture Deptt. Status of Application for Screening Test for the post of Asstt. Engr. (IT) (Advt. No:01/2015 Dtd: 31/12/2014) under Public Health Enginnering Deptt. Status of Application for appearing in the Viva-voce/interview for the post of Senior Scientific Officer (Serology Division) in the Directorate of Forensic Science, Assam, Guwahati under Home & Political Department. Status of Application for appearing in the viva-voce for the post of Principal Luit Konwar Rudra Baruah State College of Music under Cultural Affairs Department. 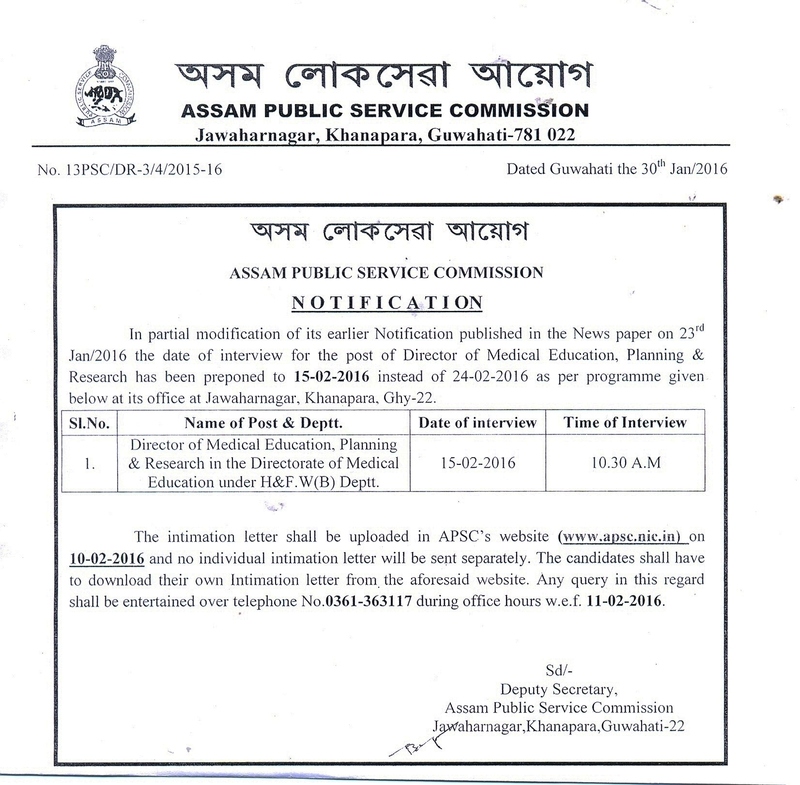 Status of Application for Screening Test for the post of Asstt. Manager/Supdt. Of Industries/ Asstt. Industries Officer under Industries & Commerce Deptt.